Azimut has always offered boats in many ways innovative, and at the very least able to keep in step with the most recent trends offered by the global market, reinterpreting these trends with a personal style that often proves to be a winner. 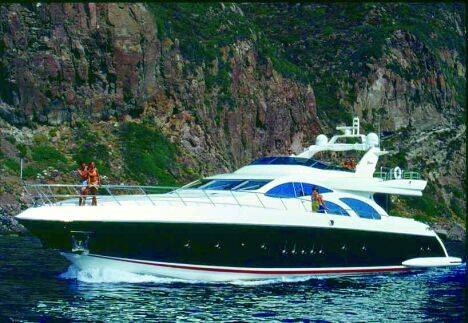 This will probably also be the destiny of the Azimut 98 Leonard, a fly motoryacht, of overall length 29.83 m. by a width of 7.05m., characterised by a very sporty design which, among its main features, offers a saloon following a concept of usability that comes very close to that of large Open boats. As a matter of fact, besides the characterisation provided by the wide lateral glass surfaces (typically Azimut), the room is marked by the presence of a canopy, positioned above the internal control station, and by a large door with semicircular glass sections, both of which can be opened completely by sliding, which communicates with the cockpit This does not only mean extreme luminosity, but also complete integration with the areas behind the cockpit, creating one single large environment of 120 sq.m. In the standard version, whose interiors have been designed by the architect Galeazzi, the 98 Leonard offers 4 staterooms each provided with its own bathroom, although the boatyard affirms that it is able to satisfy the requirements of a boat owner who wants different layouts. The recommended motorization is 2x2,000 HP MTÙs, thanks to which the hull reaches a maximum speed of 33 knots and a cruising speed of 28 knots. Azimut - via M. L. King 9/11, 10051 Avigliana (TO) - Tel +39 011 93161, Fax +39 011 9367270 - web site www.azimutyachts.net.